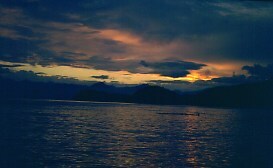 "Ole's Hakai Pass 'Black Bomber' Fly Fishing"
Odlum Point at the southwest end of Hakai Pass. The Bald eagle soaring overhead choose to scream his distinct predator territorial call as we cruised alongside one of the many islands in Hakai Pass. Disturbed by our presence, the eagle flew upwards, as they are prone to do when landing on the boughs of one of the overhanging evergreens. Then, it cupped it's wings and slowly settled on a swaying bough. 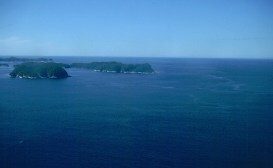 I had whistled to it when it first came in view around the point of land jutting out to the south of the island. I have done this often for this Pacific west coast emblem and have often been pleased to have them land nearby, obviously interested in my call, or, the possibility of a free lunch should we throw out a dead bottom fish. A 'Black Bomber' fights the Ole's Hakai Thorn near a kelp forest. My partner and I were fly fishing for 'Black Bombers', black rockfish that concentrate in specific zones near shoreline structure. They are an exciting fish to find, hook, and play in Pacific Northwest salt waters. This was our third day on the water, days that had started with a wake-up knock at 5:30 a.m. on our individual rooms at Ole's Westcoast Adventures Hakai Pass Floating Lodge ( 1-800-667-8898 ). After a varied continental breakfast, we were on the water just after daylight at 6:15 in ideal 16' flat-bottomed fly fishing boats. It was early September in this northern latitude ( 51'75"N), and we had come to locate specific regions where resident saltwater fish concentrated. Transient salmon use Hakai Pass as their historic migration route to the 'Inside Passage' and access to the many coastal rivers flowing into southern waters. It is an area renowned for lunker salmon, in fact the 1987 world record chinook of 85.lbs came from the waters at Barney's Point only a few hundred meters from Ole's Floating Lodge. Coho salmon are common, as are pink and chum salmon as they daily travel this wide open pass heading for their natal streams to spawn. They too are fodder for the fly fisher but require other fly fishing techniques. Our trip was a search for other saltwater fish. It is time for these other fishes to become target species of the west coast saltwater fly fisher. We had decided to search for those factors that would help us locate Black Rockfish. 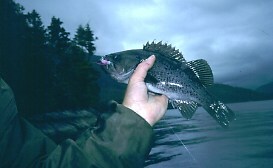 'Black Bombers', 'Black Bass', or, as they are more properly called, Black Rockfish, are a common resident species all along the Pacific Northwest. They are a mid-zone species, that is, they inhabit waters between the bottom and the surface. They are a schooling species, fish that are prone to be found in a group rather than as singles like ling cod or kelp greenling. Once a school is found it is not uncommon to get a strike on every second cast until the active feeders in the school have been caught or nipped with the fly. As success decreases it is then time to move on and search for another school. Ole's Westcoast Adventure staff greet new anglers as they arrive. Note the flat bottomed fishing boats assigned to the anglers. The first location was at the edge of a kelp bed; but, not just any kelp bed. From the surface there appeared to be no specific reason for the kelp bed the 'Black Bomber' inhabited. We could only determine that if the kelp bed was growing up from an underwater island there was more likelihood that a school of 'Black Bombers' would be found at the bottom flowing end of the tidal current. An explanation of underwater islands and directions is needed here. Tidal currents, the ebbs and flows of saltwater are constant with each tidal period except during a short slack period, that time between tide changes. Tide changes occur approximately every six hours in the Pacific northwest and may vary in depths from 16 ft. to 0 ft. Underwater islands that are either slightly exposed during low tides or just under the surface and which are within 30 ft to 50 ft deep, will have beds of bull kelp, the saltwater underwater forest. As the tidal currents occur, resulting from the ebbing and flooding of the water, the bull kelp fronds drift with the direction of the current flow. Fish, and other sea life use the kelp fronds as protection from predators and will concentrate under or near the kelp forest using the flowing fronds as protection. Such is the case with black rockfish. 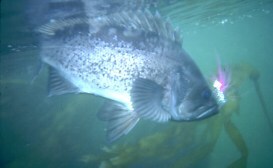 They will school in that mid-zone depth under the flowing kelp fronds or very close nearby. Directions used are flooding flows or ebbing flows to conform with the tidal current direction. 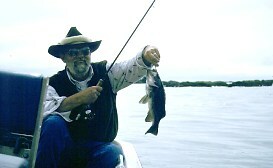 The author holds an average sized fly caught 'Black Bomber'. The second location was beside a kelp bed, at, or near, the corner where the kelp ceased. This was a favoured site and it was rare that we did not find 'Black Bombers' when we found such a kelp forest. The third location was immediately adjacent to a sheer drop, out only few yards right near the drop-off zone. These sites were located against many islands and seemed to need a shallow zone close by. We often found small 'Black Bombers' in the shallow zone, obviously a nursery area which held these smaller fish until they had the strength and skills to withstand the strong currents near the drop-off. The fourth location was at a point of land which had a strong flow of water. The constant ebbing of flooding created prime feeding locations for both salmon and 'Black Bombers'. In the past I have always been prepared for the powerful take of a salmon as well as the larger 'Black Bombers' that frequent these locations. Note the sharp poisonous dorsal spines on the 'Black Bomber'. 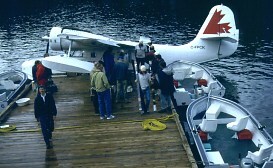 One further location we found was in a protected bay near a fast flowing gap between islands. Baitfish were obviously flushed through the gap and provided feed in this protected bay. A kelp bed forest in the bay provided even more attraction. In general we found that 'Black Bombers' were relatively easy to hook once we had found a school. We used weighted flies and one in particular, which I had created the previous year, we dubbed, Ole' Hakai Thorn, because it was so successful ( see: "West Coast Coho on the Fly with Ole's Hakai Thorn" ). It used the base of a Silver Thorn pattern but with pink wings and a flowing pearlescent mylar tail. It seemed the bottom fish found it irresistible and it became a hunting fly as well, as we searched for 'Black Bomber' sites. 'Black Bombers' are a thrill to take on a cast fly. They are powerful fish and we found the largest ( 5 to 8 pounds) would often stream fly line off our reels as we hand fought them to the boat. Hakai Pass can be noted as a prime location for these sporting saltwater fish. Ole's Westcoast Adventure's Hakai Lodge ( 1-800-667-8898 ) ( email: olefish@oberon.ark.com ) is now fully equipped with fly rods, fly lines, proven fly patterns, and anchors for their flat-bottomed fishing boats. I do feel that 'Black Bombers' are a potential target fly fishery that is just waiting to be explored by the ardent west coast fly fisher.